Google has been trying really hard to improve its Google Chrome browser, and already it has been becoming a tough competitor for other browsers such as Firefox and Internet Explorer. 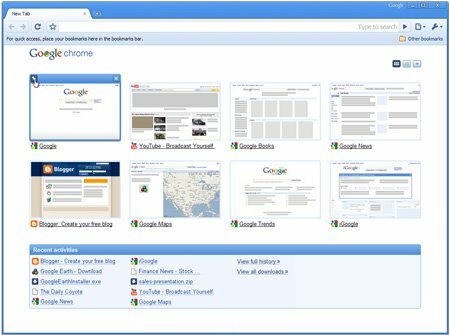 Google released a latest beta version of its browser. Download it and have a sneak preview of how would it turn out in future. As they said, the New Google Chrome Beta is faster than ever and also they tries to gave a new look to the browser windows. They have rearranged the tabs and other small stuff that show up in the first page. The best thing i love about is that Chrome is really fast not just it downloads webpages faster but when i click on that red-yellow-green Orb it opens in a fraction of second and not like Firefox and IE for which we have to wait for them to open up. This new beta is fitted with a customizable New Tab page, an improved Omnibox and a few basic themes that allow you to deck out your browser with colors, patterns and images. We’ve also built HTML5 capabilities into this release, as well as a few other nifty technical improvements that will help Google Chrome make the most of your network connection. You can learn more on the Google Chrome Blog, or download the beta version of Google Chrome to give these new features a whirl. Being on the beta channel gives you a sneak preview of things to come with occasional rough edges, but it’s a great way for us to quickly churn out new features and get your feedback. Please do comment on how you like the latest tech news from Google, do you love Google, and anything you want to tell us about.